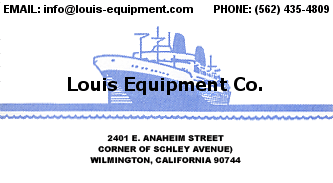 ..:: Louis Equipment Company - Our Card ::..
Website under construction since 1946! Marine equipment for domestic and international customers. Supplying light industry, film property rental and location arrangement, and lots of incredibly interesting Navy surplus stuff. Outfitted and bare hulls, workboat to ship size.